Having Trouble Talking To The One You Love? Has the joy and excitement in your relationship slowly faded away? Do you feel lonely, misunderstood, unheard, unsupported, or unappreciated? Have you tried to talk about it, and yet no matter what you say, it only leads to more arguments? When couples fall in love, they are often filled with the excitement and joy that comes from finding that “someone special.” Yet all too often, somewhere along the line, something starts to go wrong. As they try to communicate with each other about it, despite their best efforts and intentions, things often seem to get worse instead of better. When couples are unable to communicate effectively, discussions can easily turn into arguments. Feelings of frustration, resentment or hopelessness start to emerge. Eventually, patterns of criticism, blame, heightened emotion, avoidance, or constantly arguing about “who is right” begin to drive the couple apart. There Is A Way Back To Love! You can learn the 4 skills to successfully handle your problems while simultaneously enhancing your love and admiration for each other. When couples become more aware of how they are behaving, and “remember that they are speaking to someone they love,” they can re-connect with each other from a place of kindness and curiosity. From this loving place, they can then communicate with each other with respect, compassion, and a desire for true understanding. Secret #1: Beneath every complaint is a desire for love and happiness. Secret #2: Behind silence and defensiveness lies the desire to feel accepted and safe. Secret #3: When you can speak and listen from the heart, everything becomes an opportunity for intimacy. We Invite You To Go For More! While it is important to learn communication skills, it is also important to realize that all couples fight. Successful couples learn to develop a relationship to their fights. 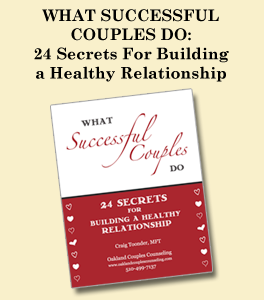 Successful couples know how to turn towards each other in times of stress. Successful couples spend time investing in their friendship, fondness, and admiration for one another. We know it can be hard to ask for support. Yet if you’re reading this, then there is a part of you that still believes in the promise of love.